I needed to run the BizTalk 2010 VHD for demo purposes, but lacked access to a Windows 2008 Server with Hyper-V in order to run the virtual machine. 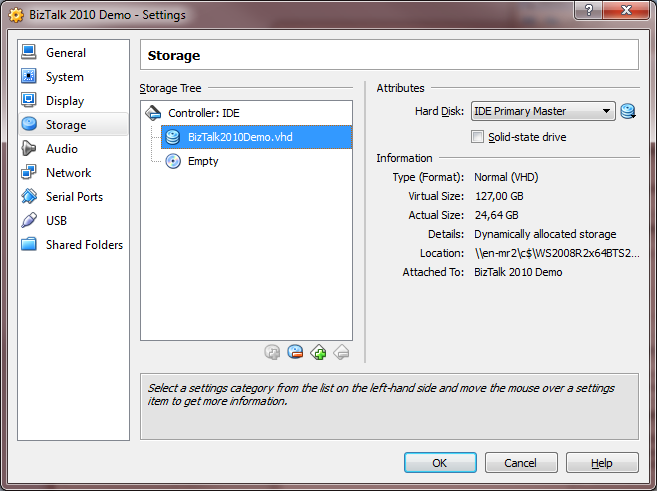 My first attempt was to simply mount the VHD file in a newly configured Virtual PC machine. 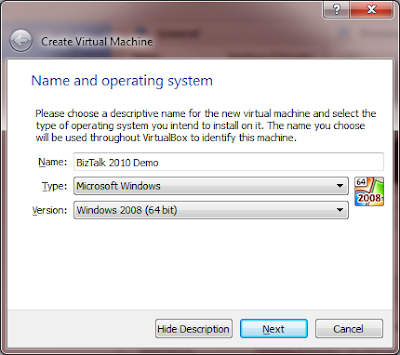 This failed with the virtual machine rebooting shortly after start. 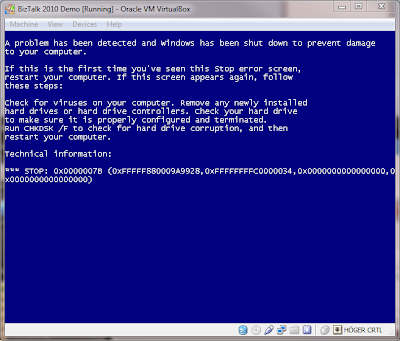 Next I tried to create a new virtual machine in VirtualBox, giving me pretty much the same result, but with a bluescreen flashing past just before reboot. In the bluescreen that quickly flashes by, it is possible to see the error code 0x0000007B, also known as INACCESSIBLE_BOOT_DEVICE. This is an indication of a possible issue with the boot sector, device driver and similar things. 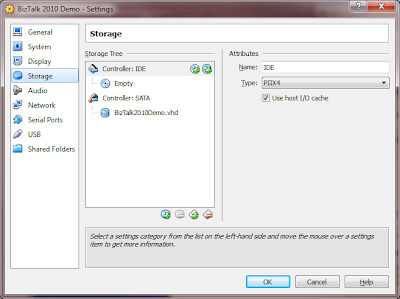 It led me to take a peek at the storage settings for the virtual machine that showed me that the IDE controller had no disks attached (but a CD/DVD drive) and my added VHD file was attached to a SATA controller. I removed the VHD file from the SATA controller and removed the controller completely. 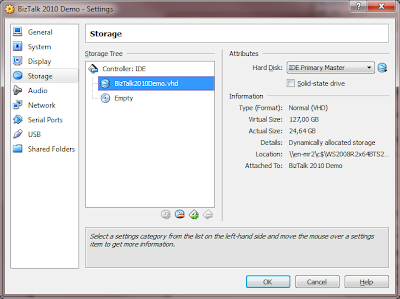 I then added a new harddisk to the IDE controller and assigned the VHD file to it, thinking that this most likely was how the VHD file was set up initially. And indeed it was so. 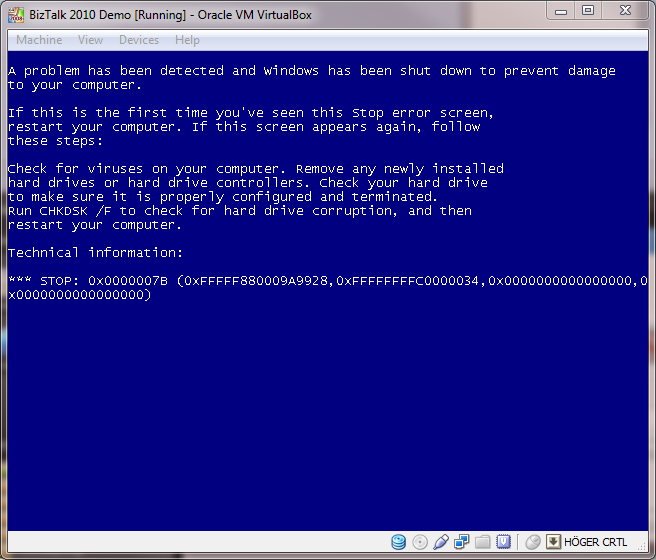 This made the virtual machine start up ok! I did run into issues when logging on though since the admin password includes the character "@" which I was unable to type due to some issue with VirtualBox and the Alt Gr key on my keyboard that was needed to type the character in. This was however quickly remedied by using the ALT-sequence instead, typing ALT+064 for the "@" character. 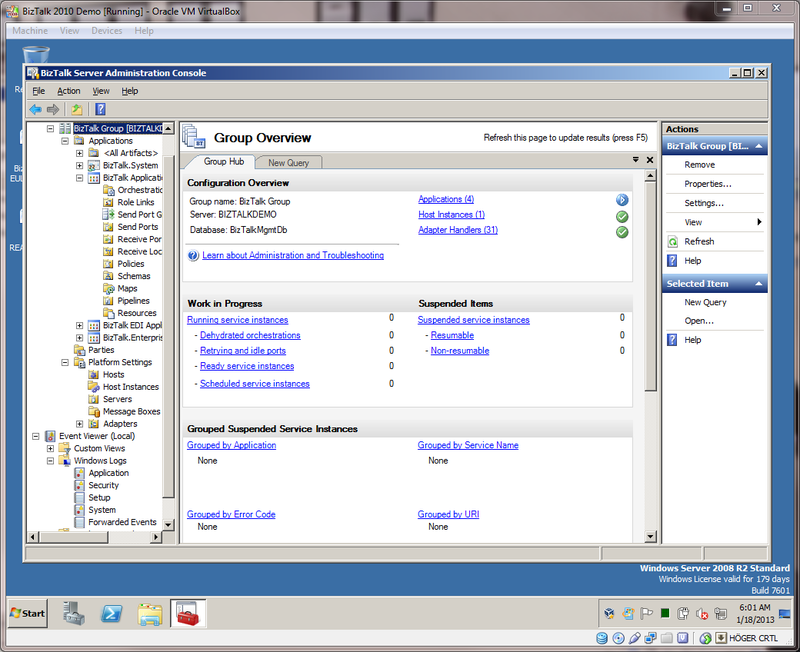 After a day of testing, I cannot see any issues in the VM, but everything is running just fine! 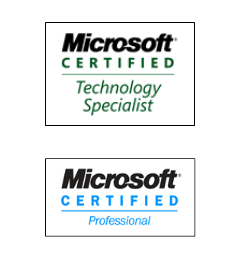 For those that are using VMWare instead, the same solution should work just as well. Great post. 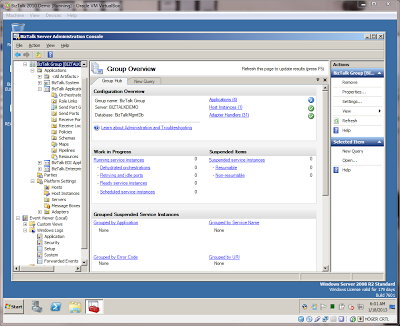 I 'm able to access the server with VB. However I have a question. 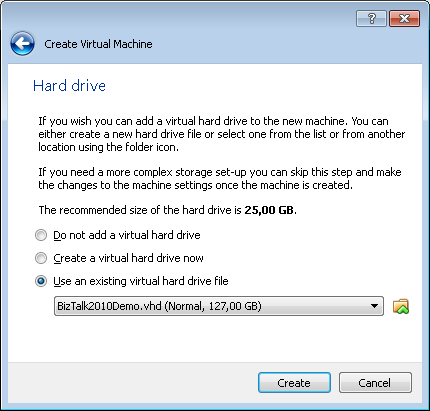 I want to work through the labs but for that I need to also mount the other virtual disk. what do you suggest for that? 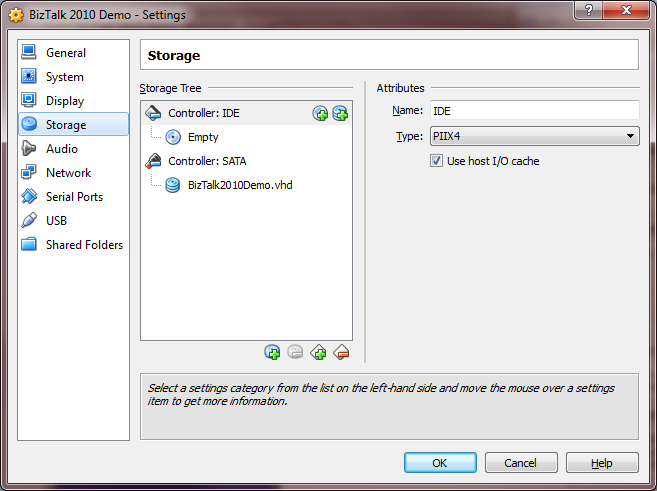 To mount the other disks, you can add them as well to the IDE controller you created. Add them as slaves (should end up as that automatically). Then you will be able to reach them from within the Windows machine. Is this what you are after? I have yet to actually run through the labs, but I'm pretty convinced it should work just fine to do it like this. Were you able to add all the VM's for the labs? Im not able to get that going. after doing the above steps when I start my VM it says windows is loading files and it keep repeating those steps and nothing else happens. Do I have to do anything else inorder to make it start. For Jay Mishra above, Hyper V must be disabled on the box.